You know what I mean, right? Big things are happening in just about every corner of the DC Universe and who doesn't want to be ready? Lucky for us, it's getting easier to take a look back at some of the threads we might want to keep an eye on going forward. Take for instance, BATMAN/THE FLASH: THE BUTTON, the event from back in April that brought Barry Allen and Bruce Wayne face to face with some unexpected enemies and even more unexpected allies. It's now been collected into a hardcover, making this the perfect time to dive back in. So break out those bulletin boards and spools of red yarn, it's time to break down some of the biggest unsolved mysteries of The Button, and take a closer look at just why, or how, they might come back to haunt us later. 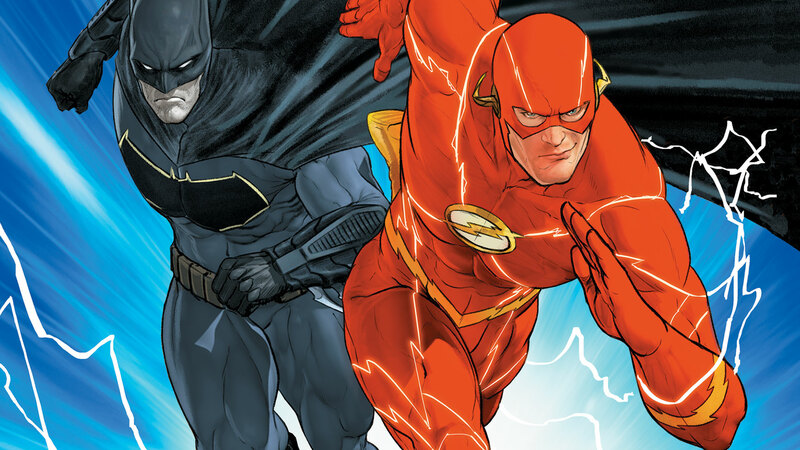 Okay, so if you've been keeping up with THE FLASH in Rebirth, this one might seem like it's already got a solution—and if you haven't been keeping up with Barry's solo book, you might want to start! Eobard Thawne's been just as much a Bogeyman for Rebirth as he has been for Barry's own personal timeline in the past. But recently, things have been even more complicated than usual. When the mysterious smiley face button summons Eobard directly into the Batcave, things don't look great for Bruce—but they don't look great for Eobard, either. Death is something Reverse-Flash is pretty well practiced in dodging, however, which is something we all might want to keep in mind as things continue. Whether through the events of The Button or the events of the "Running Scared" arc that followed in The Flash, it's a pretty safe bet that we've only started to scratch the surface of Eobard's potential fallout. Now this one might be a bit of a deep cut, especially if you haven't checked back in with DC UNIVERSE: REBIRTH #1 in a while. Remember that old man in the assisted living home crying out about "cei-u"? That's Johnny Thunder, and his name might not sound all that familiar to you, but don't worry. We'll get to that in a second. Apparently poor Johnny is still at it, crying out for "cei-u" despite the best efforts of his nurses. The Button is actually only the second time we've seen him around. Like Johnny, Saturn Girl made her first appearance back in DC Universe: Rebirth #1. But unlike Johnny, she's actually been around here and there since then. It makes sense. As a current inmate of Arkham Asylum, she is stuck in a place that heroes and villains frequency pass through. Saturn Girl is a member of the (currently lost) Legion of Super-Heroes, a massive team from the future who have been missing for quite some time, just like the JSA. We can see her in The Button panicking as she watches the same brutal hockey game Bruce has on in the Cave. But her name has come up elsewhere, too. Did you catch the JUSTICE LEAGUE VS. SUICIDE SQUAD event? Because it reintroduced a villain named Emerald Empress who, very specifically, had come to earth in search of Saturn Girl. It might be a very good idea to keep your ear to the ground with regards to both Saturn Girl and Emerald Empress in the future. Bruce Wayne's life has been pretty busy lately. With his proposal to Catwoman happening in his ongoing series, and the catastrophic events of METAL echoing out across the Dark Multiverse, things have been...well, let's just call them "eventful" for the Dark Knight. Even more so than usual. But it was in The Button that things really started to go off the rails for Bruce in a major way. When an incident with whatever temporal anomaly caused the smiley face button to appear summoned the Reverse-Flash into the cave, it also summoned a vision of none other than Thomas Wayne himself—Bruce's long dead father. Except this Thomas Wayne isn't the person who died in Crime Alley all those years ago, but rather the Thomas Wayne from an alternate universe—one that you might recognize from the events of FLASHPOINT—who became a hero himself. Now, I won't spoil the ultimate fate of this Thomas Wayne, but suffice it to say, it's pretty dramatic. And given all the other Multiversal craziness surrounding Batman right now, it might be a good idea to start keeping track of this sort of thing. You know, just for future reference. We talked a little about the JSA when we went over Johnny Thunder, so you might be surprised that The Button included another—maybe even a bigger—tie back to the original Justice Society? If you've kept a close eye on the Flash in Rebirth, you might remember a specific moment where Barry and Wally shared a mutual vision of a winged metal helmet. (That was in issue #9, just in case you missed it.) Well, unsurprisingly? That winged metal helmet is pretty important, because it belongs to none other than the original Flash himself, Jay Garrick. As one of the founding members of the Justice Society and just an all around amazing guy, Jay's got a history in the DCU that's both extensive and rich. Just ask Barry. He'd be sure to tell you...that is, if only Barry could remember who Jay is. Remember how Barry was able to pull Wally from the Speed Force back in DC Universe: Rebirth? Well, it turns out Jay might need the same treatment...but just who, if not Barry, is supposed to be his lightning rod? And is it possible that whatever is keeping him outside of everyone's memory is somehow connected to whatever is keeping Johnny Thunder away from his powers as well? You can take closer looks at these mysteries (and many more) in the deluxe edition of BATMAN/THE FLASH: THE BUTTON, which is now available in print and as a digital download. Just don’t go touching any strange buttons you may come across. Seriously, just don’t do it!